We do know there are a lot of ways to make money from home, both online and offline, but majority of these, requires a decent amount of investment, which probably some of us do not have. Here, we have listed 16 free ways you can make money from home, so you won’t have to worry about investing for a start. We are starting this in no particular order, you just need to through and find which one best soothes your need/ circumstance. Tested and proven way to really make extra income from home. These are known as Get Paid To’ websites, they literally pay you to partake in activities on their site and earn points’ to redeem as cash or giftcards. Some outrightly pay you cash and skip the points’ system. These activities include taking surveys, watching videos, downloading and playing games, taking offers, registering for free trials, and a host of other things. Below are a list of gpt sites you can join to make a few hundred quids. The good thing about this is that the more of these you join, the better your chances of making more money frequently. List of gpt websites you can join starting with the best payment threshold. They all offer gift cards too, from different associates at different prizes. This is a very lucrative way to make about £8-£10, in less than an hour. All you have to do is register with one or more companies hiring people to review websites for clients online, take a qualifying test, if passed, once they have job offers they will send you notification. You have to always check out for these alerts as everything is on a first come first serve basis, so you will want to be the first to respond. They will let you know what they need you to do, and you do this by responding back to them through a speaker. Usually last between 15 to 20minutes. Payment made mostly through PayPal, depending on the company you are working with. You can also complete easy tasks online, and get paid, though the amount made on doing these jobs aren’t much, but when they add up, they will surely serve a reasonable purpose. Most times, big companies rather than put out written surveys, prefer to have people physically test their products and services to give them instant feedback, in order to evaluate these products before putting them out to the public. Though you will have to leave the comfort of your home to participate in this, as it involves getting together with other people, the good thing is that its usually not too far from your home, except you choose to participate in one not close to your home. The payment for these groups is usually fairly good. I think the minimum we have encountered so far is £20, for about an hour project. Some pay up to ,£200 upwards, depending on the project at hand. List of focus groups you can join. There are apps that are willing to pat you just for making use of their service, which includes playing games, watching videos, doing some daily minor tasks, and probably taking surveys. All you have to do is download them on your smartphone, on both android and ios, and you can use them on the go. This is a very good way to also make good money, as you won’t be required to do anything different from what you normally do when searching the web. Site like Qmee.com are giving you the opportunity to actually make money just doing your searches, by installing their free browser extension on your desktop, so that as you do your normal searches, they will also display results for you, and when you see something you are interested in and click on it, you get paid. You can also take their surveys on your mobile or laptop, to make more money. Yes i just said free website! You can now build your website to start a blog then monetise it to start generating income and also passive income stream. This may sound easy, but you must know that to be successful at doing this, you must be willing to put in serious effort, be patient and consistent, and with time you will start seeing success results. 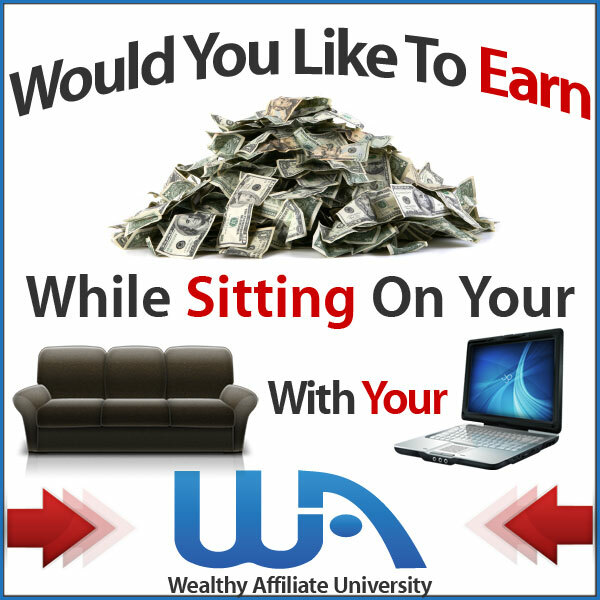 As you will need a lot of guidance to get started, this community known as Wealthy Affiliate will teach you all you need to know to get started. You can take advantage of their free signup/registration to build a free website and get 20 free lessons on entrepreneurship and affiliate bootcamp to get started. If you are passionate about something, or have a very vast knowledge or an expertise in a certain field of knowledge, you can write a course on this and sell it on udemy. The good thing about this is that if you are successful and students find your course interesting enough, for every purchase, you will make money over and over again. So it is also a0 very good source of passive income stream. If you have a good secretarial knowledge or at least a sense of organization, and writing well articulated words, this might be for you. As Companies these days prefer to hire part-time work from home assistants to the regular day job ones. You may be required to do tasks like reading and responding to emails, scheduling appointment, answering phones, booking flights and rides e.tc. this is just a few as each client needs may differ. Are you good at writing, do you think you can compose an article of about 500 words and above? Then this might be for you. Textbroker is a site that offers you the chance to write for clients in need of your writing expertise and get paid for each one successfully done. It is free to join, all it requires is for you to take a writing test to determine the level you will start with as they have 4different levels. What talent do you have, or what do you like doing that can impact people’s lives, especially those weird things you think no one will like. Site like Fiverr.com gives you the opportunity to display these talents and sell them to who ever is interested in them and your bidding starts from $5 upwards, hence their name. Registering with Fiverr is free. Though the pay one receives in partaking in medical trials are quite high, but so is the risk involved. So before you signup for any trials, make sure you understand every detail of the project before proceeding. Another downside to this, is that you might need to spend some nights at the lab or move to and fro to be monitored. To take part in this, you can search the web for those offering services within your local area. If you are the type that loves to teach, you can register with online tutoring sites that will connect you with students in need of your services. You get to decide your pay and the best time suitable for you. But remember to always be reasonable about price to avoid scaring people away from you. Superprof.co.uk- make up to £50/ hour. 10 best survey sites in the UK. There are lots of people from different non English speaking countries, that are always searching for tutors, to help them brush up their English. Most of these people want to learn in order to be able to communicate with probable business partners, or might be tourists wanting to visit the English countries, or students who want to improve their English. So they are desperate to learn, if you see yourself as one capable to mentor foreigners in English, then you should give this a try. If you are the type that loves taking pictures a lot, this is definitely worth a try. As you can now sell your pictures online. You don’t need to be a professional photographer to do this, all you need is a quality camera and nice set of adorable pictures that people will be willing to pay for. So if you think this is for you, then you can signup for free with site like Clashot and upload your pictures for sale, once they are accepted and someone downloads them, you get paid. You need to register with them to find out the full details involved. Note: this is an app that you will need to download, in order to carry out this transaction. Best ways to make money from home. That is it for today, thank you for your time and hope you found this post useful, if you did, please kindly share with others. Please do drop us your experiences when tried any of the above or other free ways to make money from home you have tried. Suggestions and questions are also very much welcomed. yes Danielle, they are definitely worth your time! Like you said, your lunch break will be a very good time to partake in some of the activities, and at any other free times you have. No amount is too little to boost our income.lol. taking activities from all those gpt sites are sure the easiest way to grab some little extras..
Like swagbucks, you just need $5 to cash out. So wont take long to achieve that. What a comprehensive list! I have been making money online for 2 years now and I still didn’t know there were so many other ways to make money online. It’s the first time that I’m hearing about Medical Trial and Focus Groups. I will definitely check into those. Thanks a ton for your recommendations! You welcome Rayhanna. We are glad you found this usedul. Those two ways you just mentioned are definitely good ways to make money too. Especially the medical trial, but that is if you are comfortable with your body being exploited by science. The focus group does well too. Doncheck out the ones we listed above,as they are all very good ones. If you decide to give any a try, please kindly comeback to share your experience if you dont mind, so that others will be more informed. There’s certainly a big bunch of ways to make a buck on the internet these days! Personally, although there are some great ways to make money, like GPT sites and searching the web, to name a couple – I think building your own website is definitely the best option because it’s an opportunity to build an online business and become financially free, which beats doing online “jobs” any day of the week. Not that there’s anything wrong with doing jobs online for extra cash lol. I guess at the end of the day, it boils down to personal preference and how much money folks want to earn. But a website is a no-brainer! *smiles* you nailed it Neil, building a website and running your own bussiness to us, remains the best option but since this takes a whole lot of hardwork and patience, not everyone will be willing to go through that. Besides some just need a quick fix.lol. just to supplement what they already have. You have found some very interesting ways to earn extra income on line. I think doing the on line surveys with the small amounts is worth probably looking into. These all sound like good ways to start out earning from home in just a small amount of spare time to help with supplemental income. you are welcomed Susan, we hope you find something that will be of great help to you. If indeed you do, ols come back and kindly share with us, ti inspire others. I had no idea there were so many ways to earn on the internet. I guess its such a big help with so many people running and starting a business from home. Thanks for sharing, I love that you included the lists of where to go too. Thanks Hannah, i am glad we could be of help to you. Have fun discovering which best soothes you. Kindly come and share with us, whichever one finally works for you.